Our Services | The Tradesmen Group, Inc. The Tradesmen Group, Inc. takes exceptional pride in the preservation, rehabilitation and restoration of significant structures throughout the United States. As a full-service building rehabilitation/restoration company, TTG self-performs multiple trades including all aspects of historic masonry restoration, concrete, flat and sloped roofing, architectural metal works, carpentry, painting & more. TTG is guided by a philosophical commitment to the practice of restoring and preserving time honored structures of our country that is centered in a belief that historic structures are priceless tangible links to our history, and that proper care and preservation of these structures is respecting from our heritage what can never again be. We engage every project acknowledging our responsibility to care for these structures with deliberate and careful action to ensure they endure for generations to come. It is TTG’s mission to serve our clients with the highest distinction in all aspects of our projects. Masonry restoration breaths life into a building by strengthening the integrity of the facade while restoring a structure to its original beauty. Removing deteriorated mortar joints and replacing these mortar joints is the process known as retuckpointing. Preservationists are not only concerned with the formulas used in the restoration of mortar joints but also the process by which the joints are restored. Improper mortar formulas can cause cracking or spalling of the surrounding masonry. Improper techniques in the removal process can do irreparable damage to brick and stone units surrounding the joints. Improper tooling can cause an efflorescent and poorly matched style of joint. It is important to employ experienced preservation specialists to achieve the desired visual beauty while restoring the physical integrity of the masonry. Research and analysis is the key component to determine the best methods to remove the effects of time from historical buildings. 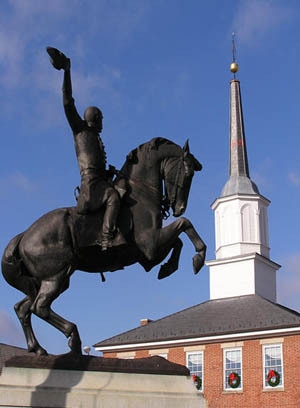 There are many ways to clean a historical monument, yet oftentimes only one right way. Improper techniques can take decades of life from these grand structures. Only after intense analysis of the surface type and evaluation of the best products for the specific application should seasoned professionals begin a cleaning process. An exact formula producing the desired results without damage to the masonry surface should be maintained for each structure. Whether it be building cleaning, masonry restoration, decorative ornamental design or re-roofing, the utmost care, precision and attention to detail is required in the field of Historic Preservation. We provide the experienced craftsmen and artisans who have mastered the art of preservation to ensure the existence of Historical Buildings for centuries. 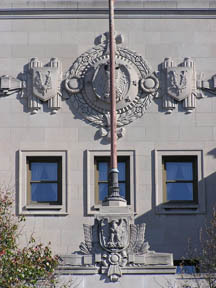 Architectural metals are common defining features on many historic structures. Architectural metals can be used strictly for ornamentation, for structural or security purposes, or to serve as moisture protection on buildings and structures. Architectural metals range from ferrous metals that require protective coatings and to non-ferrous metals that can endure the elements without coatings. TTG specializes in preservation, restoration, and rehabilitation of architectural metals to include various types of sheet metal, iron work, cast iron, copper, lead and bronze. TTG has extensive experience in assessment, design and execution of best practice principles for preserving and restoring significant architectural metal components of all types. TTG’s dedication to proven techniques ensures the historic integrity of architectural metal features will be maintained for generations. A roof imparts much of the historical significance and character of a building. Our roofing restoration specialists include skilled craftsmen in tile, slate, metal, shingle, and rubber roofing. The character of a roof is in its details of design, shape, size, and profile which can be historically duplicated to maintain the historical integrity of the structure. This attention to detail is a vital part of the restoration strategy provided before construction. The Tradesmen Group, Inc. is a proud member of The National Slate Association. These grand historical monuments often boast intricate woodworking. To restore these features one must preserve the look and integrity of the woodworking design. Architectural woodwork is an integral part of the building's significance. Often times steeples built in the 1800’s go unimproved until in dire need of repair. 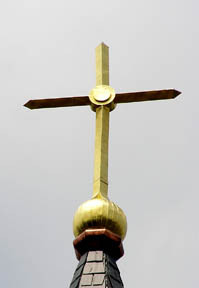 We have the expertise to stabilize decaying steeples allowing for restoration to its full beauty. Stabilization includes improving the structural integrity by strengthening and adding structural elements to the interior cavity of the steeple. Once stabilized, the steeples are able to be restored. Gold Leaf is made of pure gold, silver and copper. For thousands of years gold leaf has been applied to exterior ornamentation. There is no other coating comparable to this process for beauty, luster and durability. Applied correctly, guilded surfaces should retain its original beauty for 20-25 years. You can find the enduring radiance of gold leaf on religious edificies, public buildings and other historically significant structures. Our company studio is known for its attention to even the smallest of design detail, meticulous preperation of each restored surface and flawless execution of the guilding process. Structural stabilization is often an essential part of preserving historic buildings or structures. When structural elements on a historic building or structure age, deteriorate or fatigue stabilization is required to avoid further damage or potential collapse. Structural stabilization is often required in our historic buildings because of one or several of the following factors: 1) The structure was built before modern building codes and does not meet current code requirements and is therefore deemed unsafe; 2) A portion of the structure has deteriorated or been damaged by excessive moisture infiltration and requires shoring or replacement of structural components to avoid further damage or collapse; 3) The structure has suffered damage from foundation settlement, wind or other natural forces such as earthquakes. 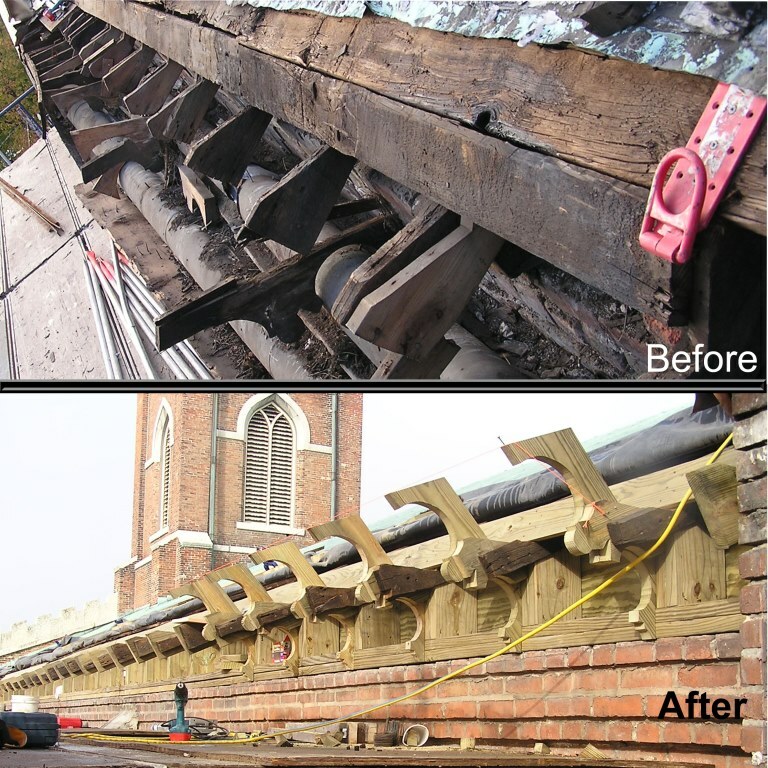 Structural stabilization of historic buildings requires exceptional understanding of the original construction, use of materials and methods of temporary shoring. TTG is uniquely experienced in structural stabilization and can provide full structural stabilization services for masonry, wood and steel structures. 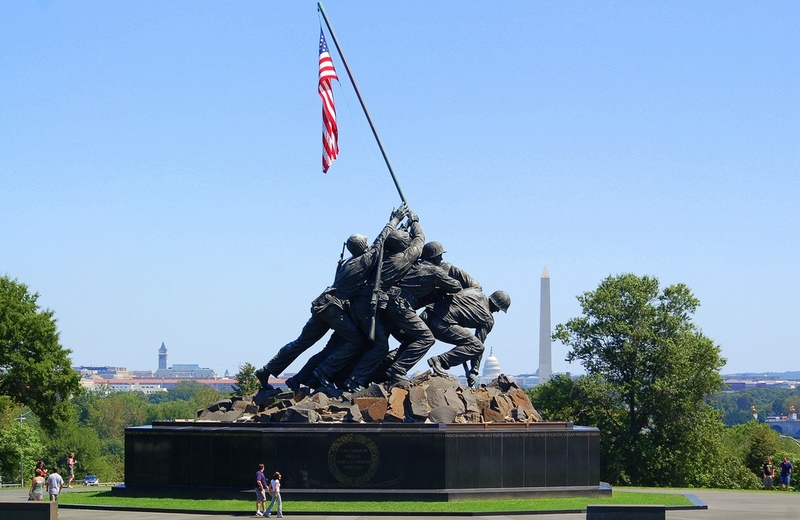 The Tradesmen Group, Inc. was honored to be selected by the National Park Services to execute conservation cleaning of the U.S. Marine Corp War Memorial in Arlington VA. Granite base was cleaned with dry sponge-jet techniques and re-polished with wet/dry polishing methods. 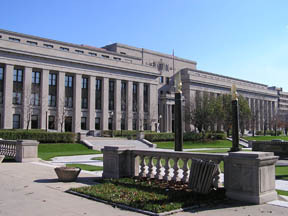 For more details about the micro-abrasive cleaning at the United States Marine Corp War Memorial, click HERE.